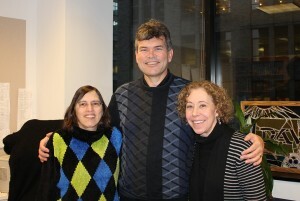 From left to right, Sheila Gilbert, me, and Betsy Wollheim. I’m jumping the gun a little bit here, since Freelance hasn’t come out yet, but here’s my upcoming “Space-Time Continuum” column for the Saskatchewan Writers Guild magazine–an interview with my editor and publisher, Sheila Gilbert, nominated once again this year for a Hugo Award for Best Editor, Long Form. As a teenager looking for science fiction and fantasy, I was drawn to the distinctive yellow spines of paperbacks published by DAW Books—a name I found amusing because DAW are the initials of my brother, Dwight Arthur Willett. In fact, those initials belonged to Donald A. Wollheim, who founded the press in 1971 with his wife, Elsie. Today, the company is co-owned and operated by their daughter, Elizabeth (“Betsy”) Wollheim, and Sheila Gilbert. Together they select, edit, and publish all the books under the DAW imprint, including work by award-winning authors, bestselling authors…and me. Sheila Gilbert, then, is both my editor and publisher—and a handy person to interview to give you a little insight into the world of a major SF and fantasy publisher. Sheila read science fiction and fantasy in her teens and attended conventions, which is how she became friends with the Wollheim family. Fresh out of university, with a B.A. in English, she was offered a job as an editorial assistant to Don Wollheim, who in those days edited Ace Books. In 1972 she moved to New American Library as an ad and cover copywriter, becoming editor of NAL’s Signet science fiction line in 1978. In 1985, when Don Wollheim became critically ill, Betsy Wollheim asked Sheila to join her at DAW. The two have run the company ever since. For 45 years, Sheila Gilbert has been intimately involved with the world of science fiction and fantasy literature. She sees science fiction and fantasy offering the ultimate creative playground for writers, readers—and, yes, editors and publishers, too.